Rick Joseph was named 2015-16 Michigan Teacher of the Year (MTOY) during a visit to Birmingham Covington School from State Superintendent Mike Flanagan. Joseph, a fifth/sixth grade teacher at the school with 20 years of classroom experience, was selected from 487 applicants statewide. “Great teachers make an incalculable impact on the lives of our children,” said Governor Rick Snyder. “We honor Rick because he’s a great teacher and also to recognize the tremendous contribution that dedicated teachers are making in classrooms across our state." 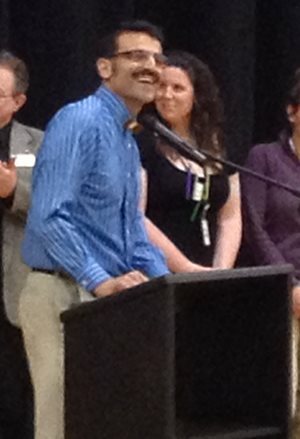 Flanagan congratulated Joseph on this recognition, saying, “Rick is an energetic example of our Michigan teachers. He believes in connecting with individuals and challenging them to reach their highest potential. We look forward to his continued contributions to teaching and learning." Flanagan noted that Joseph will carry on the valued tradition of Michigan Teachers of the Year who have shared their teaching knowledge, expertise and skills with educators across the state. Joseph said the factor that influenced him to become a teacher more than any other was the need to address systemic inequity in public education in the United States. Joseph realized he could utilize his abilities to address the achievement gap and serve those students who needed his skills the most. A first place award at the 2012 Microsoft Global Forum for Expert Educators in Prague, Joseph was one of 700 to attend the high profile event of the world’s most innovative educators, school leaders and education leaders from 75 countries, along with government officials. The Michigan Department of Education has used this award annually to honor Michigan's exemplary educators. The State Board of Education honors the Michigan Teacher of the Year with a seat at the Board table during its regular monthly meetings, and to engage in the discussions on moving Michigan's system of education forward. "When my students use their gifts and talents to improve the quality of life for people who have in any way been marginalized or excluded, then I know they 'get it.' ” Joseph said. "As a National Board Certified teacher, I realized early in my career that I need to educate my students in a way that is evidence-based," Joseph explained. "Throughout my life as an educator, I have consistently sought to strengthen and improve the teaching profession through practices that are performance-based, authentic and germane to daily instruction." Through the corporate support of the Meemic Insurance Company, Birmingham School District will receive a monetary award of $1,000 in honor of Mr. Joseph’s recognition as Michigan Teacher of the Year (MTOY) to be used for the advancement of education. The corporate support agreement between the Michigan Department of Education and Meemic Insurance Company also includes a monetary award to be presented to the schools of each of the MTOY finalists. The Michigan Teacher of the Year is selected by a committee that reviews applications from teachers throughout Michigan. Applicants submit biographies and written essays that describe educational history, professional development activities, philosophy of teaching and thoughts on emerging education trends and issues. For additional information on the Michigan Teacher of the Year program, visit www.michigan.gov/mtoy.